Linear Actuators for Solar Tracking System – Venture Mfg. Co.
With the surging demand for renewable sources of energy such as solar, across the world, the demand for components required to set up solar energy projects has also increased. The demand for solar panels, solar tracker applications, solar motors, solar gearboxes, and RV solar trackers has gone up as well. All these solar devices are equipped with actuators that contributes to their performance. Actuators for solar industry enable controlled movement of solar panels which includes tilting of panels on a single or dual axis. Venture Mfg. 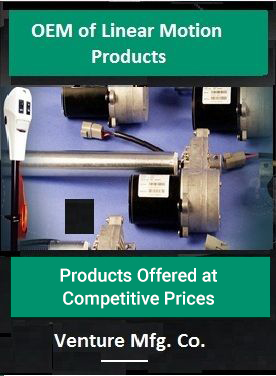 Co. is a leading manufacturer of solar actuators. Our state-of-the-art electric linear actuators are highly beneficial for solar tracking and renewable energy segments. The rugged and durable construction, and budget-friendly prices of our linear actuators make them ideal for increasing the operational value of various solar devices. Various solar tracking devices are used for renewable energy generation. Linear actuators on solar panels facilitate the required motions of these solar trackers. We regularly design and deliver the following types of actuators for solar applications. Stainless Steel Inner Tube: The inner tube of these actuators is made of stainless steel material, which makes the equipment robust, and helps deliver optimal performance for years. Anti-rust Quality: The stainless steel construction of these solar panel linear actuators provides excellent rust resistance. Great Load Capacity: The standard solar acme actuators are known for their super-hold, high-static-hold capacity, which makes them suitable for various solar tracking applications. Heavy Duty Brackets: These linear actuators for solar tracking systems feature heavy duty brackets for an excellent grip. Standard Ball Screw Actuators: Electric linear actuators help maximize the efficiency of solar panels. These solar panel tracking actuators are equipped with ball screws to gain faster speeds at continuous duty cycles. We offer ball screw actuators for solar panels and solar tracking jacks. These actuators operate at a speed of 0.3 inches per second. These come with long and standard heavy duty clamps for tube mounting, and ½" or ¾" mounting bolt kit. Robust Construction: The linear actuators for solar tracking systems are designed to deliver maximum precision while operating as high precision is crucial in this segment for accurate calculations. High Precision in Positioning: Fitted with a ball screw, guide rail, and slide block, these actuators are designed to ensure accurate positioning. Low Power Consumption: All our standard solar ball screw actuators are equipped with a high-performance motor, which consumes less power. Minimal Maintenance Required:: The actuators are equipped with nuts constructed from a special material, which helps ensure lifelong lubrication. Thus, there are no chances of fluid leakage or regular repairs, as with several hydraulic actuators. Available in Several Versions: Solar tracking actuators with ball screw threads can be availed in RoHS compliant and CE versions.